Civil Rights activist and Congressional leader John Lewis at his polling station in Atlanta, GA. Photo courtesy Early Light Productions. After the U.S. Representative (D-GA, 1987-present) clarified his reasons (to “Meet the Press” anchor Chuck Todd) for boycotting President-elect Donald Trump’s inauguration on January 20, 2017, Rep. Lewis immediately felt the heat of Trump’s Twitter fire. Trump aimed his snarky Tweets at the Congressman’s credibility and memory (yes, Lewis had also sidestepped the first inauguration of President-elect George W. Bush), character and jurisdiction. But Trump’s Tweets backfired. They revealed the President-elect’s shocking ignorance of Lewis’s respected tenure in Congress, his courageous role and stature in the U.S. Civil Rights Movement, and the status of Lewis’s congressional district and constituency. If you need convincing on that score, I suggest that you watch Kathleen Dowdey’s timely new documentary, John Lewis–Get in the Way, debuting tonight on PBS, Friday, February 10, 2017, 10:30 – 11:30 p.m. ET. (Check listings for air times and repeat broadcasts in your region.) There’s certainly no better time than Black History Month to acknowledge and celebrate the actual accomplishments and true character of Rep. John Lewis. 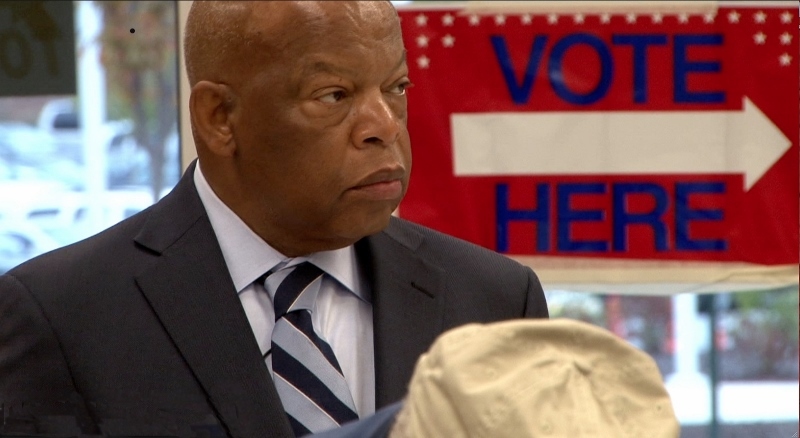 John Lewis has served as a U.S. Representative (D-GA) since 1987, but he made his mark in the front lines of the Civil Rights Movement as a young man alongside of his friend and mentor, the Reverend Dr. Martin Luther King, Jr. Producer/director Kathleen Dowdey revisits Lewis’s roots in rural Alabama. The son of poor sharecroppers, he journeyed north to study for the ministry at American Baptist College in Tennessee, a mission inspired by a Martin Luther King, Jr. radio broadcast that Lewis heard at 15 in 1955 during the Montgomery Bus Boycott. Metro policemen grabbed John Lewis, one of the leaders of the Civil Rights demonstrators, at Morrison’s Cafeteria in Nashville on April 29, 1964. Lewis was the first of many to be arrested by the police. Photo courtesy The Tennessean. John Lewis–Get in the Way reminds us of the challenges faced by King, Lewis and others committed to desegregation via nonviolent protest throughout the Jim Crow South at lunch counters, on buses, in bus terminals, hotels and schools, as well as during black voter registration drives. An overview of Lewis’s commitment to nonviolence during this period, despite the risks of severe bodily harm, is proof positive that he not only “talked the talk” but “walked the walk” as well. Lewis was arrested and jailed for the first time during the Nashville lunch counter sit-ins in 1960. During the 1961 Freedom Rides, he was repeatedly assaulted by angry mobs. As the Chairman of SNCC (the Student Non-Violent Coordinating Committee), he was the youngest speaker at the historic 1963 March on Washington. In March 1965, he led the Bloody Sunday March in Selma, Alabama, where state troopers attacked peaceful protesters with clubs, bullwhips and tear gas. 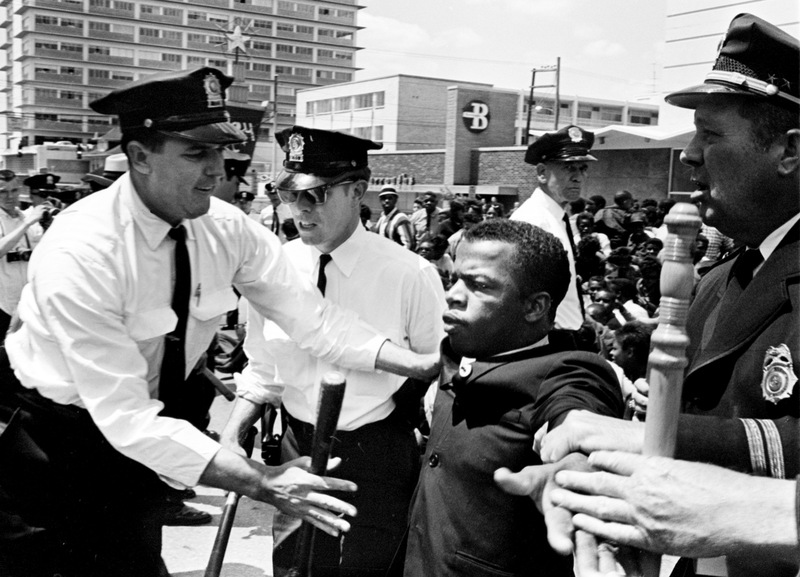 John Lewis–Get in the Way replays these encounters via graphic archival photos and news footage, as well as through thoughtful recollections from Rep. Lewis, family members, Congressional colleagues and notable Civil Rights’ activists, who underscore the political and racial dynamic that led to violent physical assaults, incarceration and even death for peaceful protesters. The positive roles played in John Lewis’s life by the Rev. Dr. Martin Luther King, Jr., U.S. Attorney General and Presidential candidate Robert F. Kennedy, and President Lyndon B. Johnson (who signed the Voting Rights Act into law on August 6, 1965) are moving reminders of inspirational leadership in this country. 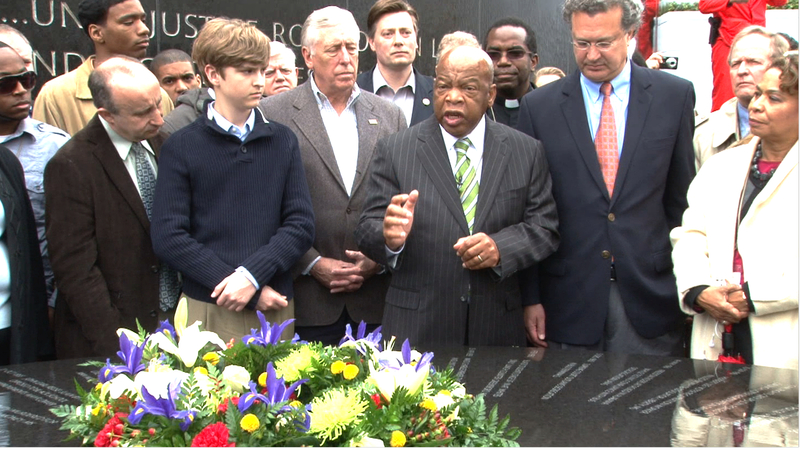 John Lewis at the Civil Rights Memorial in Montgomery, Alabama. Photo courtesy Early Light Productions. On February 21, 2017, John Lewis will turn 77 years old. He will have served in Congress for 30 years. He has been beaten, jailed and now Trump-Tweeted for standing up for human rights, voter rights, and our democracy as defined in the U.S. Constitution. There are no “alternative facts” in John Lewis–Get in the Way. Although the film is a much too brief overview of a complex, divisive era in U.S. history and introduction to the heroes of the day, John Lewis–Get in the Way should inspire all of us, including current inhabitants of the White House, to take a refresher course in the history of the Civil Rights Movement. In addition to John Lewis, an essential launching pad for film programs in schools, libraries and colleges should definitely be Henry Hampton’s landmark documentary film series Eyes on the Prize–America’s Civil Rights years, 1954-1965. This entry was posted in Film, TV and tagged African-American Studies, Black History Month, Civil Rights Movement, Eyes on the Prize, Georgia Public Broadcasting, John Lewis, Kathleen Dowdey, Martin Luther King Jr., U.S. Congress, U.S. History, Voter Registration. Bookmark the permalink. Thanks! Hadn’t realized this was on tonight. We watch Bill Maher on HBO from 10 to 11pm on Friday nights, but have set the DVR to record this. John Lewis is such a major figure. He’s been on the front lines since the early 60s. Have to wonder if Trump even knew who he was tweeting about. I hope Frederick Douglas doesn’t say something to upset his royal highness. Anyway, thanks again.